Great fun for the whole family! No matter how old, how fit you are, we have the best teaching facilities for you. With many years of experience, our teaching program guarantees enjoyment and success within a short period of time! 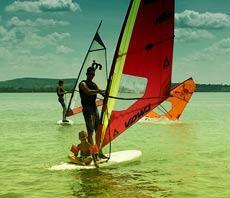 Take your family and attend a windsurfing and sailing course at Lake Balaton in Hungary! 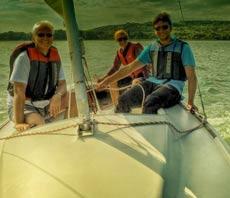 Whether windsurfing or sailing, take advantage of the unique environment and optimal conditions of Lake Balaton. 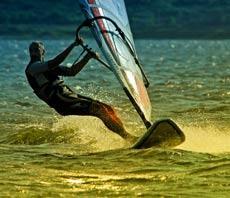 Gain an internationaly recognized windsurfing license or sailing license! The company Sail and Surf operates since 1988 at the tip of the Tihany peninsula, the most beautiful and famous place on Lake Balaton in Hungary. The water sports centre is located at the famous and popular holiday resort of Club Tihany. Due to its average water depth of only 3.5 meters, the Lake Balaton heats up very quickly and reaches tropical water temperatures of up to 30°C in summer. The mild climate and the steady winds complete the unique surfing and sailing conditions. Our Austrian, German and Hungarian team of instructors are well trained and speak the following languages: German, English, Hungarian, French Portugiese and Spanish. The windsurfing and sailing courses are held between May 1st and September 30st.